2017 saw McGregor rake in circa $160 million dollars by his own accounts. The vast majority of that figure came from his money-spinning boxing debut against Floyd Mayweather Jr. in August. “The Notorious” also has alternative financial interests such as a fashion brand and a whiskey selection, which, added to his millions made from sponsorship and endorsement deals, keeps the Irishman in serious wealth. “I’ve never thought he was coming back – I’ve said it all along,” Woodley told TMZ recently. “When he goes to fight for $60-110million – whatever he came home with – are you going to get him to come back and fight the match-ups that were most challenging to him for a fraction of that? You’re not going to do it. That next business venture for McGregor is the source of much speculation. The Irishman is undoubtedly the biggest name in combat sports today and could pretty much walk straight into acting roles or professional wrestling if he chose to. Should McGregor strike a deal with the UFC, it is still unclear who his opponent will be. With interim-lightweight champion Tony Ferguson seemingly the obvious choice, the fact that “El Cucuy” will be taking time out to recover makes things less certain. Max Holloway, the UFC featherweight champion who lost to McGregor (his last loss) in 2013, is a name which is being thrown around. While it is highly unlikely that McGregor will ever fight at featherweight again, it is not inconceivable for the Hawaiian to move up to 155-pounds. Should a McGregor vs. Holloway bout be an option, it would certainly not be a hard sell for the UFC. 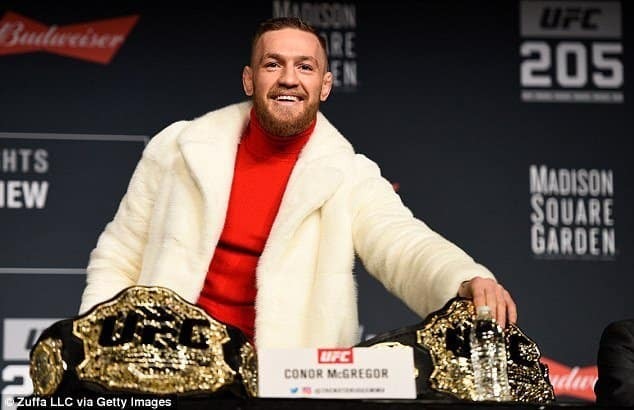 “Blessed” would bid to become only the second fighter to hold two titles in two weight classes at the same time after “The Notorious” while McGregor could be the first man to achieve that feat for the second time.